The next item that was needed for Serendipity's DT call was a new layout made with a minimum of 3 photos. I had fun playing with this one. I won a drawing from the Calendar Girls on 2 Peas and one of my prizes was a few sewing templates from Bazzill Basics. I used that to make the hearts. The borders around the pictures were made by using an eraser on the photo (I print mine at home). And, to make the "me" stand out, I painted the back with green paint. 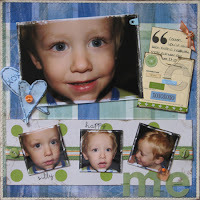 such a cute page, love all the mini photos that you fit on the page!! !